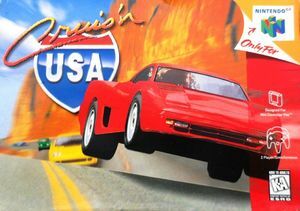 Slam the pedal to the metal and hang on for a wild race across the highways of America in Cruis'n USA. Catch all the roadside scenery and famous landmarks from three different driving perspectives - from San Francisco's Golden Gate Bridge, South Dakota's Mount Rushmore to the rolling hills of Appalachia! Select one of five difficulty levels and even remove street traffic or rival racers from the course. Select one of 10 short courses or go the distance on an extended 14-stage road race. Nintendo 64 emulation is strenuous for the Wii. Sluggish framerates can be improved by using Dolphin's options to overclock the Wii CPU (under Config/Advanced). A CPU Clock Override of 175% should keep the framerate at a stable 30 FPS (1 player only) with no noticeable side effects. 2 player mode required an even higher override of 250% to avoid slowdown on San Francisco; the most stressful track. The graph below charts the compatibility with Cruis'n USA since Dolphin's 2.0 release, listing revisions only where a compatibility change occurred. This page was last edited on 21 February 2018, at 05:30.